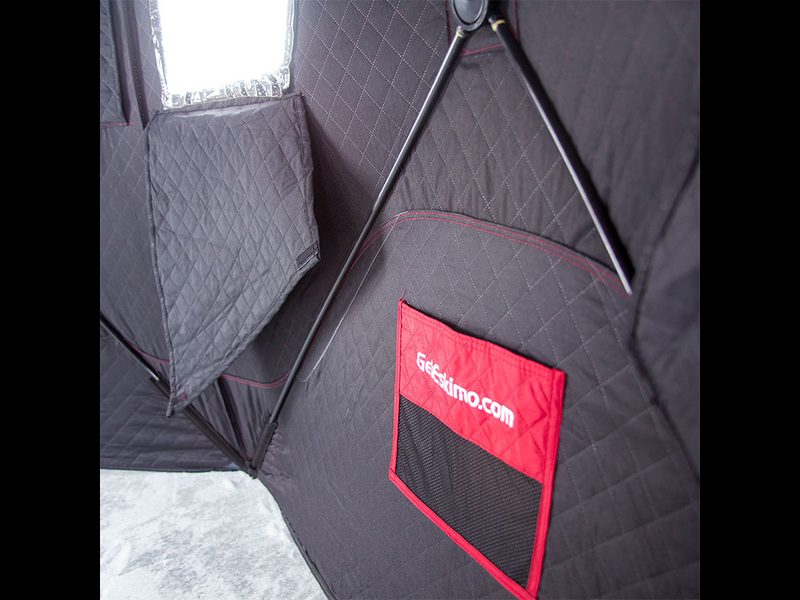 From Eskimo, "The FatFish 6120i has all the features of the FatFish 6120 Pop-Up Portable and more. In addition to the comfortable size, YKK zippers, and strong metal-ball-and-socket hub design, this FatFish also features Eskimo’s IQ Insulated Fabric. This fully-insulated pop-up shelter is 35% warmer than comparable non-insulated shelters, and will protect you from the harsh conditions of winter." I am on my seventh season of snow camping and have used everything from a simple tarp to a canvas hunting tent. In the winter, having a good shelter can make or break a trip. I am constantly looking for new gear or ways to use old gear which is why I purchased an Eskimo FatFish 6120i Pop-Up Shelter. The FatFish 6120i is a wide bottom hub style pop-up tent designed for ice fishing. But I think it has extreme potential as a snow camping hot tent. My review is going to focus on using the Eskimo FatFish 6120i with a wood stove for snow camping. I have struggled with long set-up times of other tents I have used for snow camping, so the ultra-quick setup time of the Eskimo FatFish 6120i was one of its major selling points for me. I watched a couple setup videos of the FatFish 6120i before I received mine, but I was still surprised when I first set it up in my family room. It literally took me a minute or two to set up the FatFish 6120i for the first time. It was simple and efficient for one person. It was just as easy to take down and get back into the large storage duffel bag. I was also pleased with the size. In more recent years I have been alternating between an 8'x8' and 10'x10' square tent for snow camping (with the 10'x10' being my favorite size). The Eskimo FatFish 6120i falls somewhere in between with a diameter of around 9.5'. But due to the round shape of the FatFish 6120i not all of the space is useable when cots are present. I am impressed with the fabric and overall durability of the FatFish 6120i. It is much sturdier than I anticipated. The fabric feels as strong as a cotton canvas tent and thicker due to the quilted, insulated construction. The poles and hubs appear to be durable enough to last many seasons, but it is nice to know that Eskimo offers replacement parts if ever needed. I love the doors and removable windows. The windows have blackout fabric that velcro over them and drop down when you want to see out of them. The windows themselves are attached by velcro and easily remove by peeling off. There are already two vents near the wall to roof junction, but having the ability to remove windows for additional venting is a great feature. The doors are small which is good for a snow tent, but one has to be careful entering and exiting the FatFish 6120i pop-up shelter. You have to step over the door opening to get in or out of the tent. I like the beefy YKK zippers that Eskimo uses. 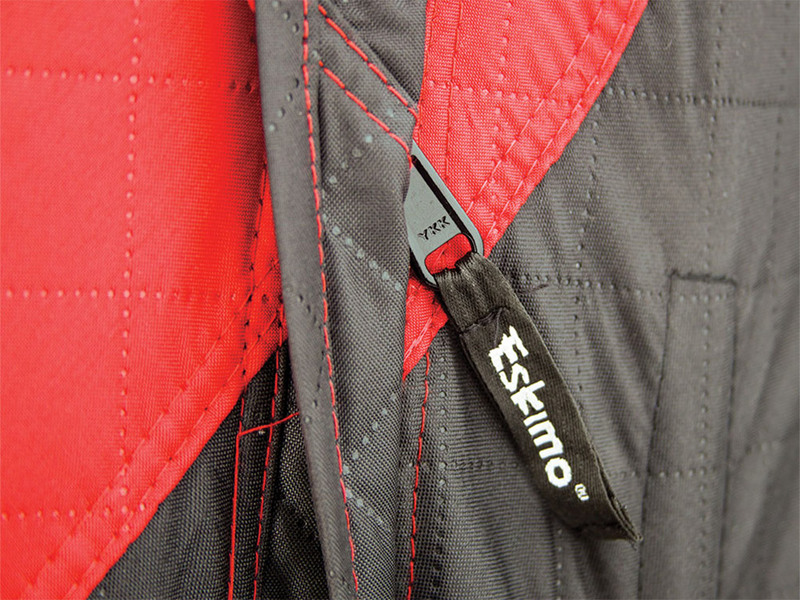 It appears Eskimo has paid attention to every detail in the FatFish 6120i. The only aspect of the FatFish 6120i that I do not like is the black interior. 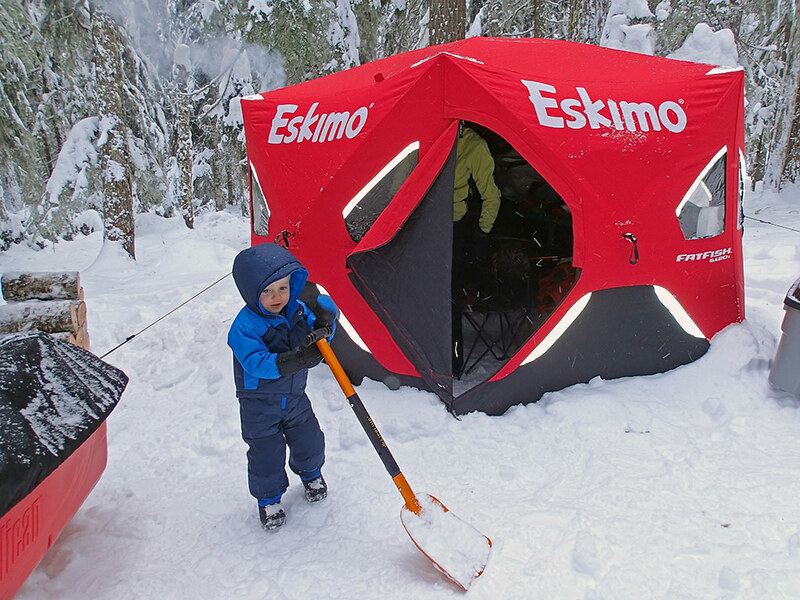 I can'f fault Eskimo since the tent it is designed for ice fishing, not snow camping. For snow camping a light colored interior works best to reflect any available light and make it easier to see. 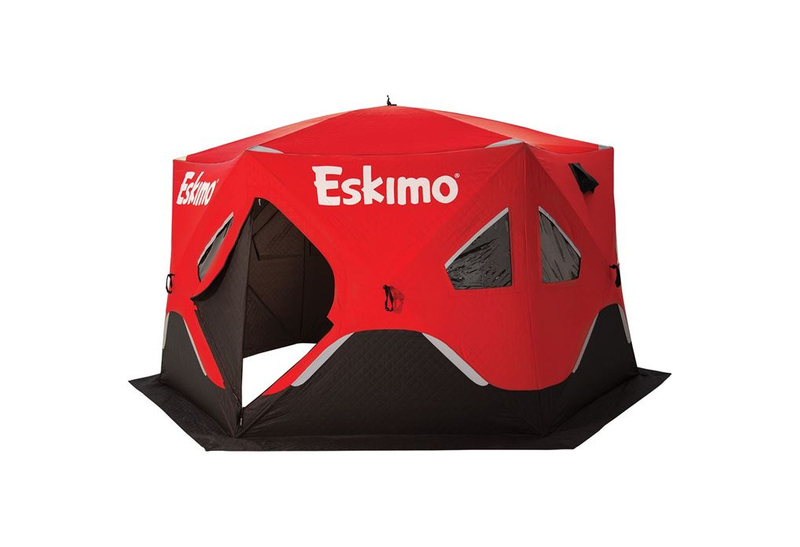 But otherwise, I think the Eskimo FatFish 6120i pop-up shelter is perfect for hot tent snow camping. Before taking the Eskimo FatFish 6120i pop-up shelter on its first snow camping trip, there were two modifications I needed to make. The first was adding a stove jack to use a wood stove. Due to the removable windows in the FatFish 6120i, this was a fairly simple non-permanent modification. I traced out a window onto welding cloth (silicone impregnated fiberglass cloth), cut a 4.5" oval hole for my stove pipe, and had my mother-in-law sew velcro around the perimeter. It turned out perfect. I made two so I would have the flexibility of placement as there are left- and right hand windows. My second modification was a removable center pole for heavy snowstorms. Because the FatFish 6120i has a collapsible roof (by design), there is the potential it could collapse under a heavy snow load. This shouldn't be an issue during the day while the wood stove is going, but at night as things cool down, it could be. A center pole will prevent the roof from collapsing. I purchased a collapsible aluminum pole designed for tarps and modified it slightly to fit the height and center hub of the FatFish 6120i. It works perfect, is adjustable, and provides a place to hang a lantern. My first trip in the Eskimo FatFish 6120i was with my wife and son near Clear Lake, Oregon. It was an overnight trip with temperatures ranging from 9 to 14°F. I set up the FatFish 6120i the day before our trip and it survived overnight alone under light snow. I was pleasantly surprised how warm the FatFish felt as soon as I set it up. It was partly because I was out of the wind, but also due to the tent fabric. The tent felt like it was becoming progressively warmer the longer I stayed inside due to my body heat alone. I was very happy with the stability of the FatFish 6120i. I set it up in trees, but it was still windy with gusts around 20-30 mph. The Eskimo FatFish6120i didn't budge an inch even before it was staked down. I ended up using six snow stakes attached to the grommets around the base with mini carabiners before covering the perimeter snow skirt with snow. I also set up 3 more snow stakes equally spaced around the sides using guy-lines. It was overkill, but I wanted to be sure the tent would be there the next morning. In the future, unless it is really windy, I will probably only use three stakes around the base and no guy-lines. When I arrived the next day with my family and fired up the wood stove (Four Dog Two Dog DX model), it took only a couple minutes before it was unbearably warm (>90°F). 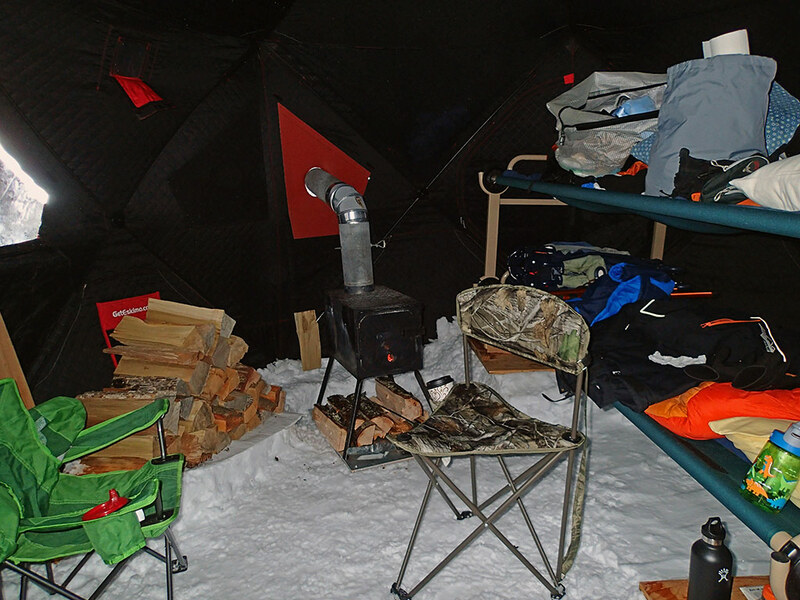 The Eskimo FatFish 6120i is the easiest tent to heat that I have used. It was amazing. I brought along way too much firewood, as I was not prepared for how efficient this setup would be. There was ample room for the three of us, but two adults would be the ideal setup. We used bunk bed cots which is what I would recommend. A third cot could be setup just before bed, but it's better to leave it stowed during the day so there is space to hang out and warm up. My wife has always been cold at night during our past snow camping trips, but not this time. I tried something new and had a small Mr Buddy propane heater running at night on low alongside the wood stove. I did this, so I could let the fire burn down and not have to get up every hour or two to add wood. It worked great and Katie actually said she was hot all night (68-72°F). Success! After my first snow camping trip in the Eskimo FatFish 6120i pop-up shelter, I am very pleased with its performance for hot tenting. It will be my go-to tent here on out. As I mentioned before, the dark interior is my only complaint, but it was still light enough during the day with the 10 windows and at night with a lantern inside. We had no problems with condensation during our trip as the interior remained bone dry. As snow melted on the exterior it beaded up and rolled off the fabric. I think Eskimo has a real winner with their insulated line of FatFish tents. Maybe someday they will branch out and offer a model specifically for snow camping. 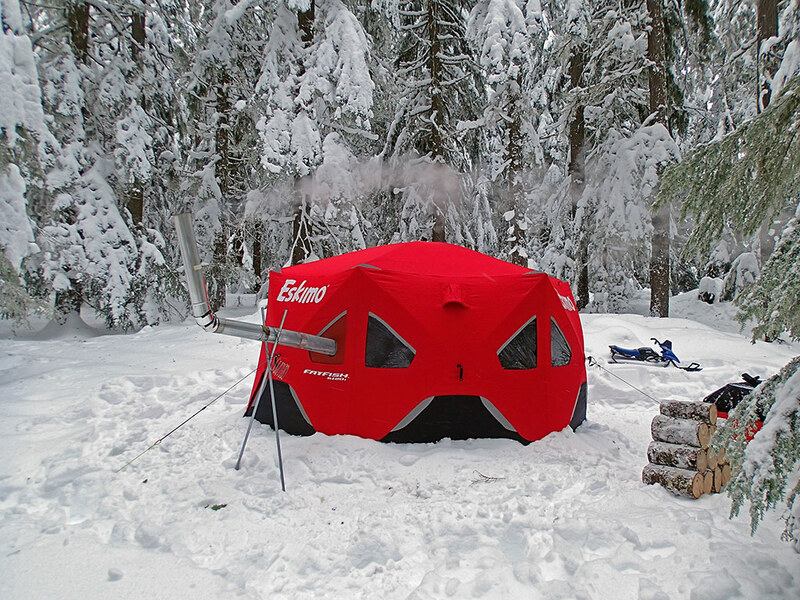 See Snow Camping near Clear Lake, Oregon adventure where the Eskimo FatFish 6120i Pop-Up Shelter was used.